Try your hand at becoming the next big thing in the wine world! 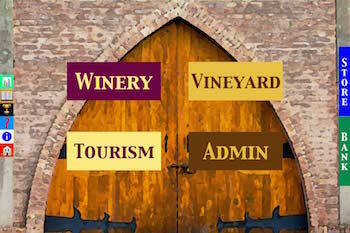 Buy grapes, make wine, improve your vineyards and winery. Above all avoid the unlucky pitfalls that may drive you to bankruptcy. While this is just a game that takes a simple view of the complex business of making and selling wine, it is based on actual numbers in the industry. The image at the left is not for the web based SimVin Lite, it is for the yet to be produced full app version. The app version is considerably more complex and detailed, and like the web version, it will be FREE! Currently the app version does not exist. I have hired several programers and artists to help make it a reality, and while they have taken my money, they have not given me anything in return. All of the logic and design is complete, I just need coders and artists to bring the game into fruition. If you want to see SimVin exist, please consider donating whatever you can to make it happen.Get your name in the credits, donate enough and get your name in the game! Try your hand at this trivia game and see how well you score. The questions get harder with each round, so watch out, there may be a trick or two! What does that word mean? Make your choice and move on to the next flash card. It is a fun game that just might teach you thing or two about wine.